The one with Enchanted Polish Igor! My sweet friend Jodi over at Captivating Claws got me the neatest gift! She bought me Enchanted Polish Igor! 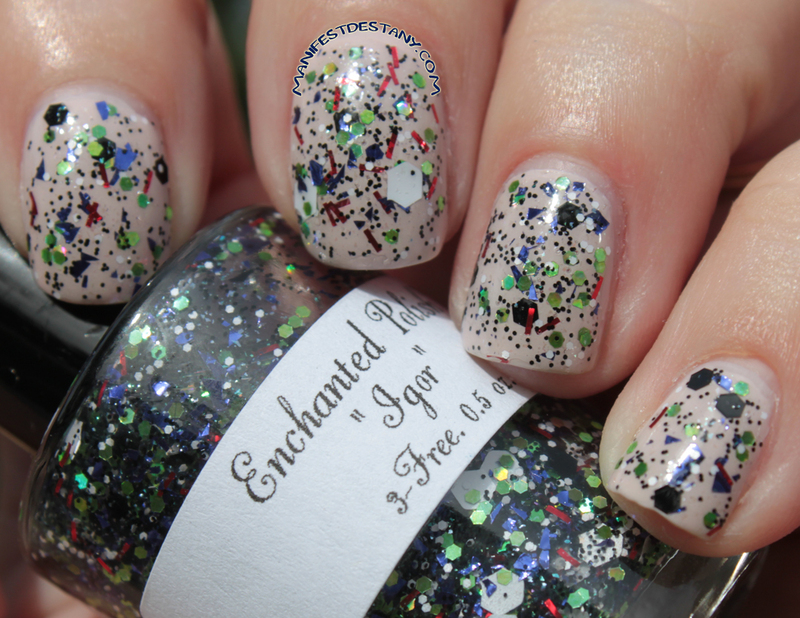 Igor is purple, black, red, green and white glitter in a clear base. The glitters are all wild! haha I wanted to put this over a color that helped the glitter stand out, so I chose ORLY Decades of Dysfunction, a pinkish white. Or well, I see pink in it! haha I love the way this looks! I had no issues with application with this glitter. I'm finding more and more that chunky, packed glitters aren't synonymous with thick, goopy messes - which is so refreshing! I used two coats of Igor over the ORLY polish.